Tip: Add new flavors and nutrients to your summer meals by exploring all the strange and wonderful seasonal produce in your CSA (Community Supported Agriculture) boxes and at farmers markets and food coops right now. August overflows with the most flavorful and nutritious produce of the year. A late summer trip to your farmers market or food coop is bound to put you face-to-face with new and unusual seasonal produce you have never cooked before. Take advantage of this opportunity to go on a produce adventure – seek out strange veggies that bring new flavors to your dishes, offer a variety of nutrients and will likely become new local favorites. Celeriac – It may be ugly on the outside, but celeriac – also known as celery root – has a nutty, sweet celery flavor that is delectable boiled, braised, steamed, roasted or eaten raw. Delicious in gratins, roasted with meats and shredded for salads and slaws, this is one ugly veggie that deserves a place on your plate. Cuke Nuts – Also known as Mexican sour gherkin cucumbers, these small cucumber-like fruits look like tiny watermelons and are perfect for adding to salads or pickling whole. Garlic Scapes – These whirly twirly shoots at the top of the garlic plant are actually mildly flavored flower buds. Lucky for us, garlic growers cut off the scapes to send more energy to the developing garlic bulb. Use them to make pesto, chop them up in a salad or salad dressing, sauté and add to eggs or stir-fried vegetables, or try them in a garlicky soup. Heirloom Tomatoes – A far cry from the mealy red tomatoes you find at the grocery store in winter, fresh heirloom tomatoes come in all different bizarre shades and shapes. Green zebras, gold medal, Cherokee purple – each variety bursts with its own distinct flavors. Slice them fresh in a caprese salad or slow roast them in the oven with garlic and spices. Just don’t miss these gems of summer! Kohlrabi – Enjoy both the bulb and leaves of this versatile veggie raw or cooked. Kohlrabi is a cruciferous veggie that adds crunch to slaws, salads and grain bowls. You can also roast it or add the bulbs to soups. Lemon Cucumber – At first glance, it looks like a lemon – but this cucumber varietal is similar to lemons in appearance only. Perfect for slicing in salads and pickling, lemon cucumbers are milder, with more tender skin, than a traditional cucumber. Romanesco – These chartreuse beauties are as intriguing to look at as they are delicious. Romanesco is actually an edible flower in the same family as broccoli, cauliflower and cabbage. It tastes similar to traditional cauliflower, but with more crunch and a slightly nuttier flavor. Chef Marshal’s Indian-Spiced Romanesco and Corn Salad is a delicious way to try this one-of-a-kind veggie. Tatsoi – Also known as ‘spinach mustard’, tatsoi is a broad-leafed green vegetable with a distinct flavor and crunch. Delicious eaten raw or cooked, it can substitute for spinach, lettuce or salad greens. Celebrate this season of abundance and expand your taste of summer by taking every opportunity to try something new. Unsure of how to use your unusual finds? Ask your farmer – most will be happy to share their ideas on delicious ways to prepare their crops. 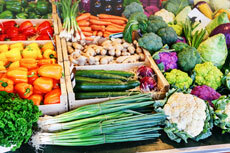 Also, look for cooking demonstrations that feature seasonal produce at your farmers market or coop. Your adventure in unusual produce will add new flavors to your summer, diversify your nutrient intake and provide a great conversation starter at your next summer potluck.